Alexia is an exceptional musician. She was born fully sighted but, at the age of two, lost her sight completely due to an optic nerve glioma. Since then music has played an important role in her life. She is an accomplished flute and recorder player and a uniquely talented composer. Since she was eight, Amber has helped at different stages in Alexia’s musical career with funding for recorder lessons and braille music lessons, and most recently flute lessons, whilst she studied at the Junior Department of the Royal College of Music. Amber also co-funded the purchase of a silver flute for Alexia with the Florence Nightingale Aid in Sickness Trust (FNAIST). 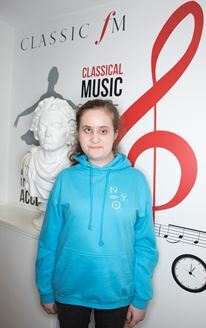 Alexia was a member of the National Youth Recorder Orchestra, and a composer with the National Youth Orchestra – the first blind musician to join the NYO. She is achieving great success as a young composer. In 2016, she won Cambridge Young Composer of the Year, the first female composer to have won the competition in its 10-year history, and her piece was performed by members of the Hermes Experiment. Other recent successes include winning an RPS/Classic FM 25th birthday commission prize resulting in the performance by members of the RLPO on 11 October 2017 and winning the 2018 BBC Inspire Competition leading to a performance by the Aurora orchestra in the BBC Proms Series. Amber is proud of Alexia’s musical successes and the role it has played in supporting her talent and looks forward to watching her career develop. This year she received offers from all the conservatoires she applied to and has just begun studying composition at the Royal Northern College of Music. Her commissioned piece by the Cambridge Music Festival for the Brodsky Quartet will be premiered on 19th November at St John’s Divinity School in Cambridge and she will shortly begin working on the BBC commissioned work as a result of winning the BBC Inspire competition.